David Hilbert (1862-1943) was a German mathematician instrumental in discovering and establishing the foundations of mathematics as we understand them today. His numerous significant developments range from algebraic theory to fundamental geometry to mathematical physics. Artist Christian Faur is creating a portrait series of notable mathematicians. His intention is to memorialize these important figures and to educate the public on their invaluable contributions. The house depicted in “Foundations of Sand” is a model home that was constructed on a Nevada nuclear test site in order to observe the effects of nuclear bombs on typical American dwellings. The image is based off of a photo taken on March 17, 1953, which captures the house just moments before being completely destroyed as a result of a nearby nuclear blast. Christian Faur recreated this image using printed Abrahamic texts from the three major religions in the Middle East. These fragments of the Koran, Torah, and Holy Bible are shredded and mixed together to form the representation of the ill-fated house. Several strips are gilded with 24 karat gold to symbolize the precious nature of the texts. A golden lamb heart rests at the bottom, referencing instances of both holy sacrifice and idol worship found in these religious books. This work portrays a moment of climbing tension before the impending storm. In 2008, artist Christian Faur developed a color alphabet system which assigned all 26 letters in the English alphabet a unique color. Vowels and other letters that occur frequently in the English language received bold, primary colors, while lesser-used letters were assigned secondary, more subdued hues. The system uses these colors to transform language into a visual image, allowing Christian Faur to create “paintings” out of text alone. This color alphabet has been universally adopted for use in alternative education, and has been the foundation of several works by Christian Faur over the past decade. “Portrait of God” maps every word in the King James Bible (Old and New Testament) in this color alphabet, displaying each of the 4+ million letters as color “pixels.” Using white to separate each of the 790,039 words, the image can be “read” from left to right, top to bottom using a key. From afar, striations and blocks of overall color variation can be observed, showing the many changes in language used in the different books and chapters of the text. Faur was born in 1968 in New York City and moved throughout his childhood, from Chicago to Los Angeles to Sacramento. Making art was his constant, “the thing I always kept for myself.” After serving in the Army, he earned a degree in physics from California State University, Northridge, then taught physics and math at an L.A. middle school while exhibiting his oil paintings on the side. In 2000 he settled in Granville, Ohio, where today [he is] on the faculty at Denison University… In 2008 he finished an MFA in visual art and new media through the Transart Institute, a program based in Austria and New York. It was Christmastime in 2005 when Faur was building a wooden crayon box as a gift for his daughter that inspiration struck. 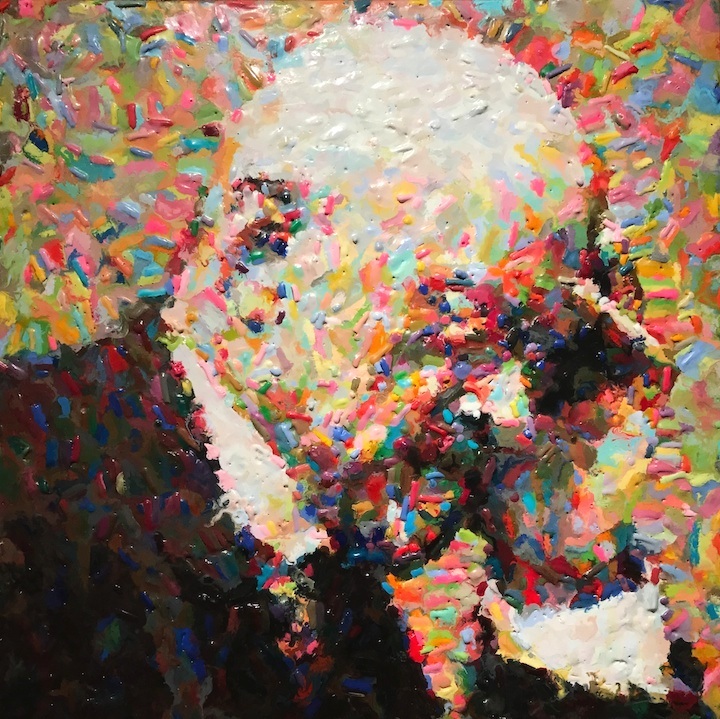 He was painting and sculpting with encaustics then, and had come to enjoy the versatility and properties of wax, “this fantastic surface quality that’s neither glossy or varnishy or highly polished, nor matte or dull.” But handling those crayons, observing how their tips absorbed light and conveyed dimension and texture when piled en masse, spurred his imagination. "The things that inspire me to create, I find, are buried deep within the structures and systems that form the underpinning of our natural world. My studies in the natural sciences have made me aware of these hidden layers of complexity present in even the simplest objects. These invisible layers are seen most clearly through the lens of logic, which is used to decipher the underlying rules and laws that govern the physical world. Download Christian Faur's ebook "A Box of Crayons" for free here. Use Christian Faur's color alphabet converter here.